· · Startup Time Two Minutes. · · Fully Stainless Steel Construction. · · Fully Automatic Control System. · · Can Make Coffee and Tea at a Time. · · Tank Capacity Two Litres. · · Can Get Two Litres Coffee & Tea Decoction within 20 Minutes. · · Industrial Heavy Duty Heater. · · Adjustable Warmer Temperature. · · Power 230V A/C, Heater: 1000 Watts Warmer: 200 WATTS,4 Amps. 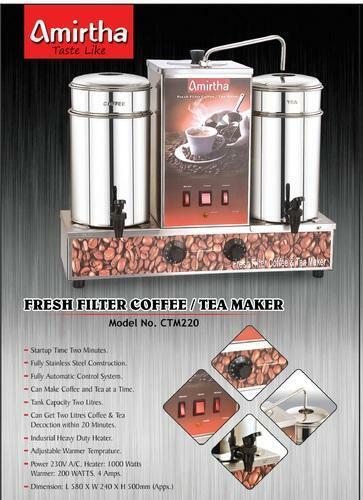 Established in the year 2005, we Amrithavarshini Enterprises, are manufacturer of Coffee Maker Machine, Milk Boiler Machine, Tea Maker Machine, Vending Machine and Tea Boiler Machine. Designed in compliance with specified norms and using quality tested raw material our range is extensively used among our clients. With the assistance of our experienced professionals, we are able to meet the bulk requirements of our clients within the committed time frame. Owing to our ethical business practices, we have become one of the preferred choices of our clients. Our quality conscious clientele is extremely satisfied with the products and services offered by us.